The Uplinx Remote Phone Control Tool's Bulk Background Images wizard deploys background images from your desktop computer to any number of Cisco phones within a CUCM cluster. 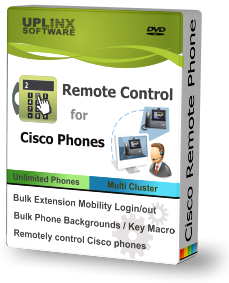 The uploaded image is automatically resized to the requirements of each Cisco phone. For maximum image quality, it's best to use an image design tool to resize the images and import them into the tool. 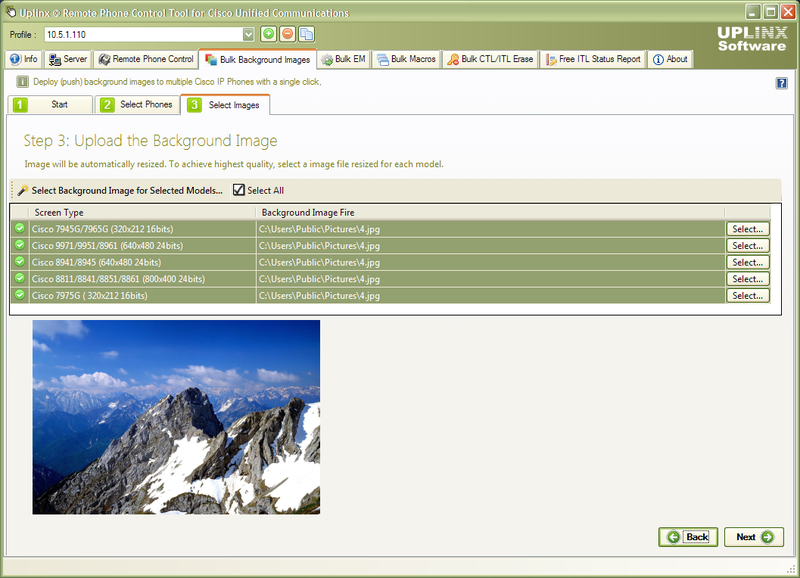 The Bulk Background Image wizard, along with all other bulk features, requires a Professional license and is not included with the Standard license. Automatically resize any uploaded image: Automated resizing of your uploaded image to the correct size for each Cisco phone model. Specific sizes of images per phone model can also be uploaded for maximum image quality and maximum control over the image content. Deploy to single or group of phones: Easily select a single or group of phones to deploy the background image to. The phone-group can be built based on device pool, model, extension range, location and phone description. Automatic preparation of Cisco CUCM phone settings: To deploy background images, enabling Web Access and Phone Personalization is required on the Cisco phone. This is performed automatically for you as a step in the wizard. Scripted or manual execution: Create your own script to deploy background images from the command line to automate deployment or to implement a specific logic. To get started, download your trial version now and follow the steps to Deploy Bulk Background Images for Cisco phones.